Philip Doddridge was born in London on 26th June 1702, the son of Daniel and Monica Doddridge. He was the youngest of twenty children born to his parents, but only the second one to survive infancy. Indeed, when he was born his health was so poor he was not expected to live, and he was plagued by ill health all of his life. His only surviving sibling was a sister, Elizabeth, who later married a clergyman. Monica Doddridge died in 1711 and Philip was placed in the care of Daniel Mayo of Kingston-upon-Thames, a Dissenting minister who ran a private school. This may have been the school founded by Rev. John Bauman, Monica’s father. Bauman was a Lutheran minister who had fled from Bohemia to England to escape religious persecution. In 1715 Daniel Doddridge died, leaving Philip an orphan. He then entered a private school in St Albans and came under the guidance of Samuel Clark, minister of a Nonconformist church. About this time, Philip's guardian (Daniel's former business partner) was declared bankrupt and Philip had to sell what remained of his family heirlooms, with the exception of his grandfather's German Bible, in order to save himself from the debtor's prison. Now destitute, Philip was offered a home by his sister, and the Duchess of Bedford offered to finance his education providing he would agree to become an Anglican clergyman, even though he was set on becoming a Dissenting minister. Fortunately for Philip, Samuel Clark, who had become like a second father to him, offered to finance his studies, and, in 1719, secured a place for him at the Dissenting Academy at Kibworth Harcourt, run by Rev John Jennings. The Kibworth Academy was founded in 1715 and was located in the White House main building. Dissenting Academies had become established because nonconformists were barred from attending Oxford and Cambridge universities. The Academy rivalled the great universities of Oxford and Cambridge, teaching Hebrew, Greek, philosophy, logic, algebra, trigonometry and theology. 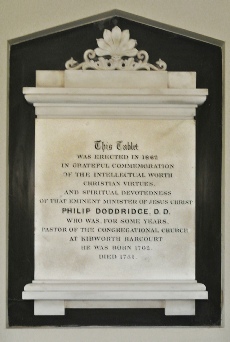 Following his studies, Philip Doddridge became pastor at Hinckley for a year, but returned to Kibworth as pastor and principal of the Academy after the death of John Jennings. He remained for seven years. In 1725 Doddridge moved house to Market Harborough and until 1729 the pastorates of Kibworth and Harborough were shared. In 1729 the Kibworth Academy closed, transferring to Northampton, when Doddridge was appointed pastor at Castle Hill Congregational Chapel. Around this time, Doddridge married Mercy Maris. The Northampton Academy, in Marefair, became a famous and influential seat of learning and, it is said, even Church of England ministers sent their sons there rather than have their morals corrupted at the universities. Students attended the Academy from all over England, Scotland, and the Netherlands. In 1736 the University of Aberdeen awarded Doddridge a Doctor of Divinity degree because of his many accomplishments. By the age of 48, Doddridge had developed consumption (tuberculosis) and, on the advice of his doctor, was sent to Portugal, where it was hoped the sunshine and warm air would cure him. The cost of the trip was paid for by Doddridge’s many friends and admirers. Unfortunately the trip was too late to save him and he died on 26th October 1751. He is buried in the English cemetery in Lisbon. Doddridge’s book: “The Rise and Progress of Religion in the Soul”, led William Wilberforce, the great anti-slavery campaigner, to become a Christian. Although he wrote over 400 hymns, they only circulated in manuscript form during his lifetime, and were not published until after his death. His most well-known hymn is “O Happy Day”. A memorial plaque to Doddridge, shown here to the right, still exists in the Old Chapel. Photograph of part of a montage of pictures and photographs of the ministers and pastors of Kibworth Congregational Chapel that was on display in the chapel until closure in 1997. The following article is extracted from ‘The Life and Times of the Royal Infirmary at Leicester, The Making of a Teaching Hospital 1766-1980’ by Ernest R Frizzell, first published in 1988 jointly by The Leicester Medical Society, The Post-Graduate Medical Centre and The Royal Infirmary, Leicester. The Reverend William Watts (1725-86) MD (Aberd), LRCP (Lond) was the prime mover for establishing a hospital in Leicester. When he was first ‘properly qualified, Watts was appointed honorary physician to what was then the County Infirmary at Northampton, in 1757, just 14 years after its founding by the former Kibworth Academy headmaster, the Rev. 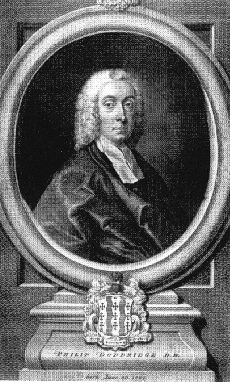 Philip Doddridge, DD (1702-51) and the Rev. James Stonhouse, MD, already a physician on its staff. Impressed by what he saw in the relief of human misery, Watts resigned the appointment after five years and set himself to secure something similar for his own birthplace. If the trumpet give an uncertain sound, who shall prepare himself to the battle? Watts saw Leicester as his Corinth and the better to prepare himself for his battle and no doubt to emulate the example of Stonhouse, he took holy orders in the same year (1762) and became curate in charge of the church at Medbourne. Watts’s campaign in Leicester may have been based upon that adopted in Northampton, but in their scheme to establish a hospital, the planners had followed Bristol (1735), Winchester (1736), Exeter (1743) and Shrewsbury (1745) where, in each, the motivation came from the endeavours of a clergyman. In so far as Northampton is concerned and certainly in so far as the interest of Leicester was related, the influence of the Rev. Philip Doddridge is the back-cloth to the scene that was unfolded and it is therefore pertinent to the story of Watts's achievement that something should be told of the other two actors, back-stage as it were, without whom the history of the Leicester Royal Infirmary might not have started as it did. Philip Doddridge (1702-51) came of Devonshire stock. His father was Daniel, son of the Rev. John Doddridge of Shepperton and his mother, the daughter of the Rev. John Bauman, a Hussite refugee, who settled at Kingston-upon-Thames and became master of the Free Grammar School. Philip was the last of the twenty children of the marriage of whom only he and a sister survived. At the age of 17 years and already two years an orphan, through the influence and beneficence of the Rev. Samuel Clarke, minister of the Congregational church at St Albans, he was admitted as a pupil to the academy of the Rev. John Jennings at Kibworth. His uncle, a solicitor, happened to be steward to the Duke of Bedford at the time and the duchess had offered to pay for Philip's education at either Oxford or Cambridge, but this would have meant a transfer of his religious allegiance and "he scrupled about conformity". Jennings, a native of Kibworth, "a gentleman of great piety and usefulness ... had the honour of having Dr. Doddridge for a pupil". Nichol states that he transferred his academy to Hinckley in 1722, Doddridge going with him, but Jennings died in the following year. However, such was the progress and reputation of Doddridge that, still without ordination, he accepted a call to return to Kibworth as minister of the Congregational church of 150 members at a salary of £35 per annum and he brought the academy with him. Without mentioning the move to Hinckley, Arnold and Cooper infer that, on her husband's death, Mrs Jennings wanted the house in Kibworth for her own use and Doddridge had to make do with lodgings, first with the family of Perkins in Little Stretton and then with the Freemans, whose daughter he wanted to marry, at Burton Overy. The location of the academy after his return to Kibworth is unknown, but in 1729 he moved it to Market Harborough, though it was only for a year. His services as a preacher were increasingly in demand, chiefly to Presbyterian congregations. At last, in 1730, he was ordained and accepted a call from the Congregationalists at Castle Hill in Northampton. It was a decision which he described as causing him "a great deal of anguish, both in regard to those friends whom I am called upon to resign [he was still the minister at Kibworth] and in reference to that great and difficult work that lies before me, in the case of your large congregation and my academy". The call provided him with a house on the east side of Sheep Street which was large enough to accommodate his students and where, in the same year and with an annual income increased to £120, he found himself in a position to contemplate marriage to a Miss Maris of Upton-on-Severn. With their Anglican tradition, the universities of Oxford and Cambridge were still not admitting dissenters and it was chiefly for that reason that the nonconformist academies originated, the largest of them at Warrington, in 1734. Without a licence from the bishop, even the keeping of a school by a dissenter was contrary to law and Doddridge found himself arraigned before the civil court at Westminster, in 1734. He won his case and, from that time, dissenters could engage in teaching without episcopal authority. His academy prospered to the extent that in 22 years, with general subjects directed towards entry to the professions and ranging through algebra, trigonometry, languages, history and logic, it had more than two hundred students of whom 120 entered the church. One of the latter was the Rev. Job Orton who, for seven years, was a member of Doddridge's teaching staff and one of his four assistants at the chapel. Born in Shrewsbury, Orton returned there in 1741 and was instrumental in establishing the Salop Infirmary, in 1747. By any standard, Doddridge was a remarkable human being. In a relatively short life span of 48 years (he died in Lisbon of pulmonary tuberculosis, having been sent by his congregation to recuperate), he accomplished a quantum of work and service that was exceptional. The two colleges of Aberdeen University, Mareschal and King's (the college of William Watts), each conferred upon him the honorary degree of doctor of divinity, an honour unlikely in his own country because of his nonconformity. He wrote more than 370 hymns and there are few hymn books today that do not contain several of his compositions. He counted Isaac Watts, John Wesley and Dr Herring, Archbishop of Canterbury, among his friends, but Samuel Clarke, of St Albans, remained the friend of his age as well as his youth, "far above the casualties of time or variations of health or fortune".